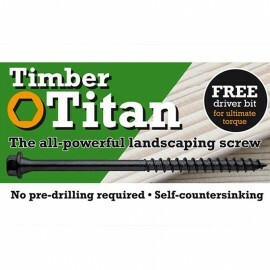 Our Timber Titan self-tapping and self-countersinking wood screws are ideal for most garden and landscaping purposes. They are designed specifically to pull large sections of timber together. By powering into the wood without the need to pre-drill pilot holes, the sharp point and tenacious thread make light work of securing decking bases, fence posts and railway sleepers. Driving a screw into a hole that isn't counter-sunk, gives the screw a very small point of contact, the force alone will tear the wood grain apart. A counter-sunk screw has a large surface area to drill a clean cut wood funnel, resulting in your screw being forced directly downwards ultimately giving you a clean finish. Alongside the screws self-tapping and self-countersinking abilities, they are pre-coated to prevent corrosion and have undergone 2000 hours of salt water testing so that we can guarantee you a durable and long lasting screw. A FREE drill bit is included with each pack. Not suitable for saltwater applications or oak. Please see our ASP Stainless Steel Flat Countersunk Head Decking Screws 60mm should you require a stainless steel screw for an oak product.